This year’s Art in The Barn exhibition at browngrotta arts, art+ identity: an international view, is right around the corner. While planning your trip to see art+ identity we suggest you take advantage of a few of the area’s other cultural offerings. 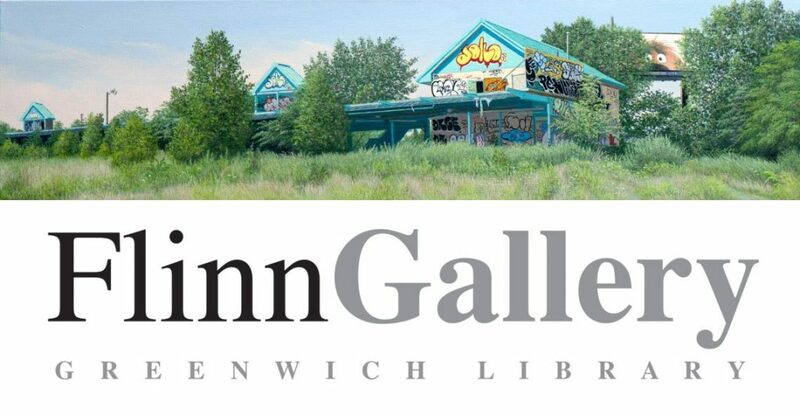 In Greenwich, the Flinn Gallery’s exhibition Spaces of Uncertainty provides viewers with an opportunity to take a deeper look at beauty of marginalized areas. The exhibition, whichfeatures work by painter Valeri Lark and photographer Linda Kuehne, explores how obsolete structures, whether abandoned parking lots or dilapidated builds, fit into an narrative in which every site in our highly programmed built environment must fulfill a designatedrole. Larko’s detailed oil paintings of decaying infrastructure, graffiti-masked neighborhoods and vacant lots show how marginalized sizes are never truly abandoned. Kuehne’s is more focused on the suburbs, and the deterioration of buildings that were partof the commercial sprawl in the 50s and 60s. Find more information on the exhibition, which is set to run through April 30th, HERE. Looking for a good book to curl up with on the beach or beside the pool thissummer? Have no fear, Wilton Library’s gigantic book sale is set to take place during art + identity. Theannual sale will run from April 27th to April 30th at Wilton Library. This year, the sale will have more than 80,000 items in more than 50 categories, ranging from mysteries and histories to books for babies. There Library will also have a large collectionof its’ rare and collectible books on sale from the Collectors Corner. All sales from the Library’s annual book sale help the library to stay afloat and provide the Wilton community with the learning resources for all ages. More information on the book salecan be found HERE. 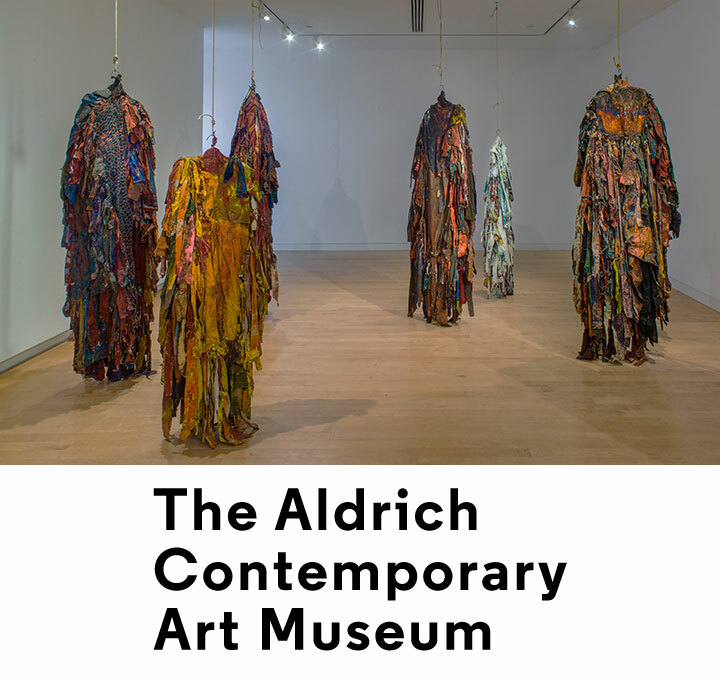 Just a short fifteen-minute drive from browngrotta arts, the Aldrich Museum of Contemporary Art also has a variety of art-offerings. The Museum’s current exhibitions include Harmony Hammond: Material Witness, Five Decades of Art, How Art Changed the Prison as well as a variety of pieces by artists N. Dash and Danh Vo.Visit the Aldrich’s website HERE for details on all the exhibitions, hours of operation and a list of all of their art-offerings. 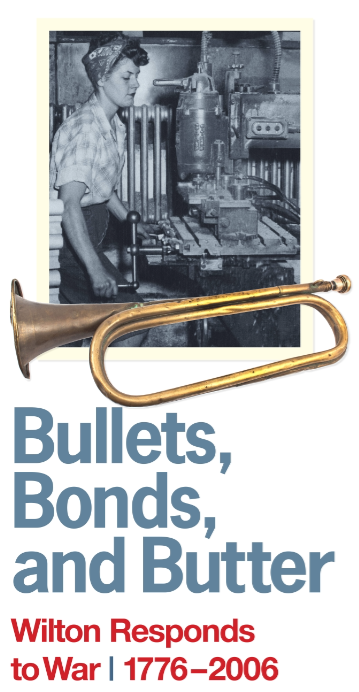 Last, but certainly not least, the Wilton Historical Society’s Bullets, Bonds, and Butter: Wilton Responds to War 1776-2006 commemorates the contributions of community members, both soldiers and townsfolk, who have answered the call to war from the Wilton area. While troops fought on the front lines, Wilton community members supported the war effort in all sorts of ways. Whether rationing, writing letters to the troops, knittings socks and making bandages or buying war bonds,the home-front consistently put all their effort into supporting their friends and family members overseas. Check out Wilton Historical Society’s website HERE for hours of operation and more information on the exhibition. Details for attending art + identity: The exhibition opens on April 27th with an Artists Reception and Opening from 1 p.m. to 6 p.m. at 276 Ridgefield Road, Wilton, CT. http://www.browngrotta.com/Pages/calendar.php. From April 28th through May 5th, you can visit the exhibition from 10 am to 5 pm. A full-color catalog will be available at browngrotta.com after April 27th. The exhibition features more than 60 artists and 100 works of art. 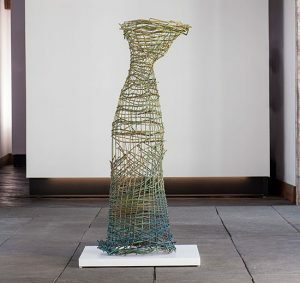 We started off the month of March with a beautiful willow sculpture by Dawn MacNutt. Like many of Macnutt’s pieces, Shades of Green is an interpretation of universal human form. In creating her work, MacNutt draws inspiration from ancient human forms that were present in ancient times, as well as humans and emotions in the present. 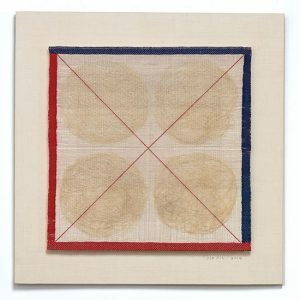 Harmony of Yin Yang I, Shin Young-Ok , mosigut (fine threads made of the skin of ramie plant) linen & ramie threads. 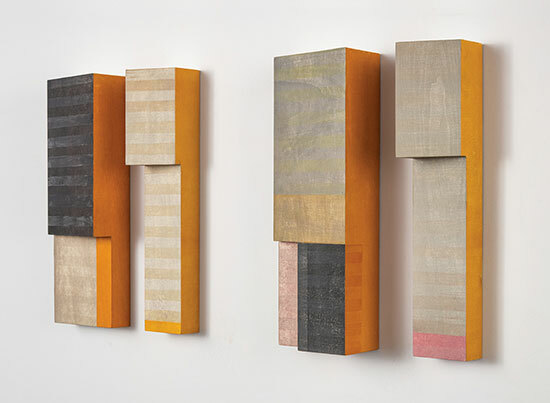 Korean ramie fabric, 24.875″ x 24.625″ x 1.5″, 2014. For the second week of March, we broke the status quo and shared a walkthrough of our online Artsy exhibition An Unexpected Approach: Exploring Contemporary Asian Art. The video, which can be viewed on our Instagram, Facebook or YouTube channel, presents viewers from all over the world an opportunity to see an assortment of astonishing Asian-inspired art. If you are curious about a piece in the video walkthrough make sure to check out the exhibition Artsy page HERE, or give us a call. 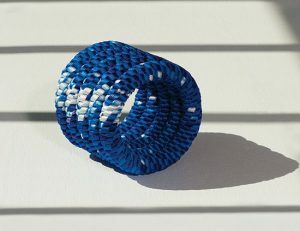 Water Is Eternity, Keiji Nio, woven and braided nylon, 4.5″ x 4.5″ x 3.74″, 2009. 9th triennale internationale des mini-textiles – Angers 2009. Next up on the queue was Shin Young-Ok’s Harmony of Yin Yang I. Made using mosigut (fine threads made of skin of ramie plant), linen and ramie threads, Harmony of Yin Yang I explores the origins of harmony in Asian philosophy. The ying yang sign, which is considered complementary rather than oppositional, embodies dualism, the idea that all energy has an equally powerful, opposing energy. 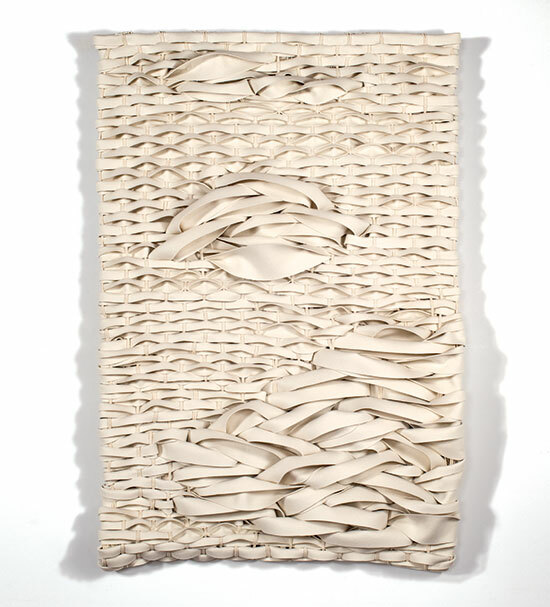 To finish off March we shared Water is Eternity, a woven and braided nylon sculpture by artist Keiji Nio. Nio creates sculptures with the traditional technique of kumihimo. 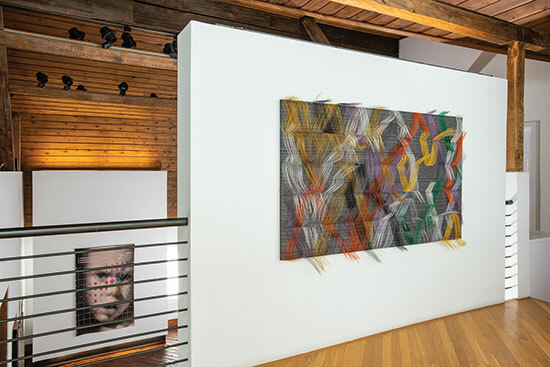 In the past, Nio has used the technique to create works that have been featured in the International Biennial of Tapestry in Lausanne as well as the International Miniature Textile Triennial in Angers, France.